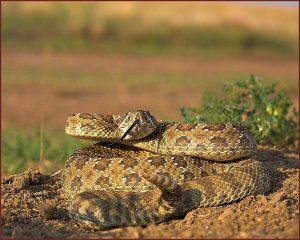 Prairie Rattlesnake is a venomous species of Pitviper snakes found in certain regions of US, Canada and Mexico. Their name comes from the rattle that is situated at the end of their tails. They have many common names including Western Rattlesnake, Western Prairie rattlesnake, Black Rattler and Missouri rattlesnake. This species is counted among the most poisonous snakes in the world. This is a beautiful species of snake. Here is a general description of this species. These snakes are quite large in size, growing more than 100cm in length. The largest recorded snake was 151.5 cm long. They have three to four “Internasal Scales” between the scales surrounding their nostrils. This is a major distinguishing feature of these creatures. Two “Pit Sensory Organs” are located on both sides of their head. 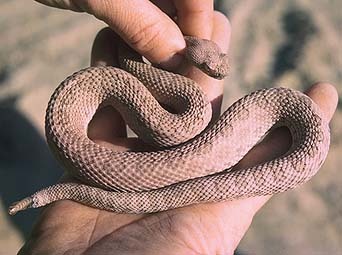 The base color may differ from one snake of this species to another. They can be of various colors including olive green, grayish brown, tan, straw yellow and orange-brown. They have a diamond shaped head with a relatively thin neck. Their backside is marked with dark colored blotches. The front side is cream or pale yellow without any distinguishable markings. A rattle is located at the end of their tail. This is one of the most unique features of this species. The young snakes are usually somewhere between 17 and 33 cm in length. They look quite as same as the adults. These snakes are mainly found in the western regions of United States, northern areas of Mexico and southeastern Canada. The main area of distribution includes Colorado, North and South Dakota, Montana and Idaho. They live in areas where they can easily find food. They are mainly found in dry rocky lands with moderate vegetation. They are also found near ponds and wetlands. Sometimes, they occupy the burrows of other small animals like rats and ground squirrels. They may wander in an area with a range of 5 to 7 miles from their burrows during summer. The behavior patterns of these reptiles are similar to other Rattlesnakes. 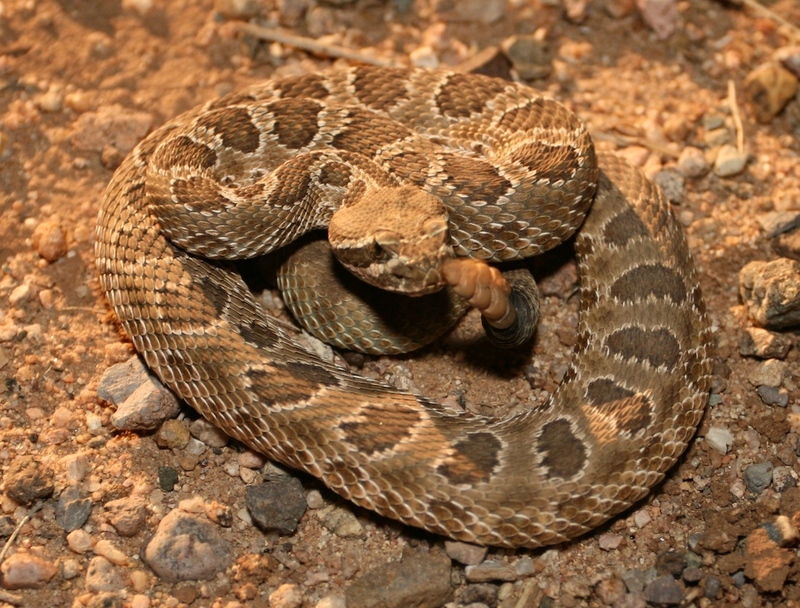 Prairie Rattlesnakes make a unique rasping sound by fast vibration of their tails. It is a warning sound for other animals to keep them away. The Prairie Rattlesnakes are diurnal during winter and nocturnal in summer. These snakes defend themselves from attackers with the help of their deadly poison. They live communally in dens and burrows. They use their “heat sensing pits” to identify any warm blooded animal nearby. Like other snakes, their tongues work as a sensory organ helping them to understand the surroundings. They do not attack unless it is absolutely necessary. This species is counted among the most dangerous predatory snakes in the world. They generally feed on small mammals like mice, ground squirrels, prairie dogs and rabbits. 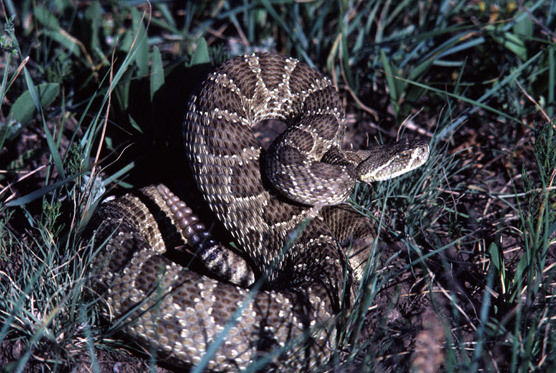 The Prairie Rattlesnakes, especially the juveniles, may prey on amphibians and smaller reptiles. Animals and birds like skunks, coyotes, ravens, hawks and eagles prey on these snakes. Their adaptations make them a very powerful species in their environment. The rattle helps them to warn off enemies like large animals and humans. The patterned coloration helps them to stay camouflaged in light vegetation and deserts. These creatures are viviparous giving birth to 1 to 25 young snakes at the time of reproduction. The female snakes give birth in communal burrows between August and October. The number of surviving young snakes may vary from 4 to 12 depending on the environment and availability of food. They usually take around three years to become adults. The female Prairie Rattlesnakes may not reproduce each year. The average lifespan of these Rattlesnakes is 16 to 20 years. Currently there are nine recognized subspecies. 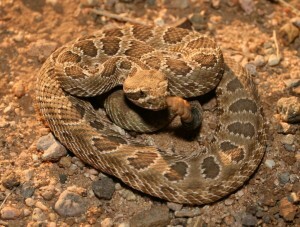 The most important ones include Hopi rattlesnakes (C.v. nuntius) and Prairie rattlesnakes (C.v. viridis). These are one of the most poisonous snake species found in western US, Mexico and Canada. Most wild animals try to avoid these snakes because they have the ability of striking with a large quantity of lethal poison in a single bite. Their venom is deadly enough to kill a human. Therefore, humans handle them with special precautions. These reptiles become inactive with low metabolic rate and body temperature during the coldest winter months. They hibernate in their dens. The skin of these creatures does not develop along with their growth. Due to this reason they shed their skin as they grow in size. Prairie rattlesnakes molt 1 to 4 times in a single summer. They rub their nose on ground in order to push the old skin over their heads. Once the skin becomes loose, they crawl out of it. Recently caught snakes of this species are quite hostile, however, they usually calm down in a few weeks time. Having knowledge about taking care of poisonous snakes is important in order to keep these Rattlesnakes in captivity. Housing: A 50” × 25” tank is adequate for an adult. The substrate of the tank should contain a 2” deep layer of aspen shavings. Rocks and pieces of wood should be placed in the tank to provide the snakes with nice basking spots. Temperature: A daily 12 hour heat cycle is required. The tank should be kept at a temperature of 86°F during day and 73°F during night. Lighting: Using an incandescent light bulb is enough to provide the right kind of lighting. Diet: One should feed them with rodents like mice and rabbits. It is not advisable to feed them too much otherwise they become obese. Handling: It is never advisable to handle these snakes with bare hands. Snake tongs can be used for the purpose. One should wash the hands properly with antiseptic soap after handling them. Following are some interesting facts about these creatures. These snakes add a new segment to their rattle each time they shed skin. This is the only poisonous snake species found in the Canadian prairies. The juvenile snakes of this species are as poisonous as the adults. The members of this species are listed in the “Least Concern” category by the IUNC. It means there are no immediate threats to the existence of these reptiles. The Prairie Rattlesnakes are an amazing species of snakes. The fact that they are fatally poisonous has not stood in the way of people having great interest in them. Here are some photos of these gorgeous snakes. I LOVE these snakes. I like the yellow-bellied sea snake the best though.